Tiverton is a classic, easy to wear pullover featuring mirrored cables on front and back, long twisted rib cuffs and a deep scoop neck. Perfect for layering, and versatile enough to throw on with jeans or a flirty skirt. Tiverton is knit in four pieces and seamed together, with a casual straight fit and set in sleeves. 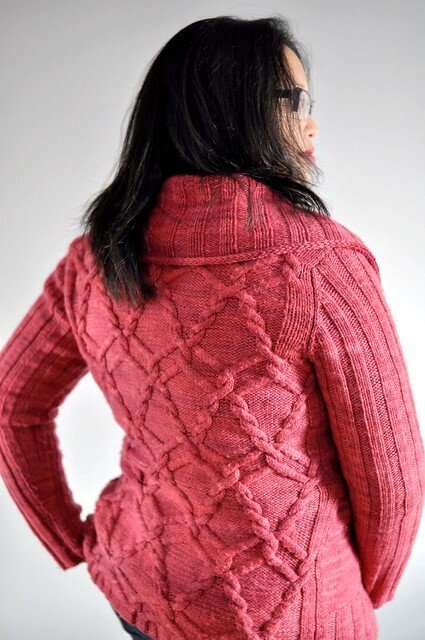 The ribbed collar is picked up and knit in the round. The squishy organic merino from O-Wool provides amazing stitch definition and a smooth yet wooly feel. Meant to be worn with zero or positive ease. 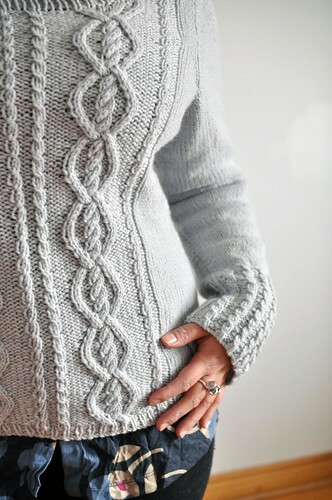 For the best fit, measure a sweater you like the fit of, and make the size closest to it. Shown in size 36” / 91cm with zero ease. Technical Editing by Alexandra Virgiel. DK or worsted weight yarn. 9 skeins in Overcast for size 36" / 90cm. 7 page PDF pattern includes charted cable, schematic and abbreviations. Measurements in imperial and metric.